Looking back it doesn't feel like more than 2 minutes ago and I was pretty fortunate to start blogging so close to one of the most memorable Federer matches of recent times – the epic Federer vs. Djokovic Semi final where Roger put in a stunning performance to win in 4 sets. How did my Blog look back then? As you can see it's changed quite a bit since I first started and I've actually gone through a couple of major design changes. What started as a simple blog layout with a handful of readers has developed into a more magazine style layout that's visited by lots of Federer fans on a daily basis which I am extremely happy with. I'd also just like to say a big thankyou to everyone who has read this blog, commented here or shared one of my posts be it on Facebook & Twitter. Without you guys I doubt the blog would have continued for 2 years but with you guys returning here and commenting more and more often it's become a great destination for both Federer and general tennis fans to share their views on the GOAT. 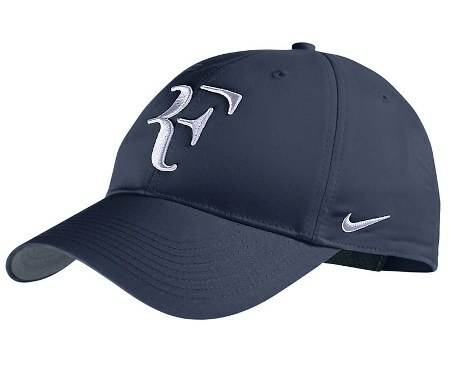 Like last year I'm doing another giveaway for the fans, this time I'm giving away five Nike RF baseball caps, all you need to be in with a chance of winning is to complete my very own Roger Federer quiz – more details below. 5 of these are up for grabs! To be in with a chance of winning you have to complete my Roger Federer quiz, the questions have been devised by me and are sure to put you through your paces. Although don't worry there's some easy ones too so even if you have only just started watching Federer you will be able to answer them. There's 25 questions in total, once you have answered them you will be asked to submit your email address. Although this is a quiz, I'm picking 5 winners completely at random. You can take the quiz as many times as you want, but it's 1 entry per person. Any attempts to game the system will result in instant disqualification. The competition closes on Monday 10th June and it's open to entries worldwide! If you have any questions about the quiz or any problems with it, just leave a comment below and I'll get back to you. Thanks! Winners are drawn at random to make it fair 🙂 the quiz is just the fun part. Anyway, Happy birthday PeRFect Tennis! Let Me add this Jonathan, this is not a blog anymore.. this is qualified for a legit tennis website for tennis especially for Roger Federer. It’s easy to navigate unlike other blogs that looks like a puzzle with all the posts mixed up with ads. This has, more often than not, ad free. Maybe Roger should hire you to revamp his website? It really looks old. I mean, he’s one of my favorite players, but his website is being left out by others. Thank you Jonathan for creating and maintaining such a great blog. And also thanks to all those passionate fans of Roger whom I read their comments with great joy. Once I was a football buff! But after my childhood hero, Paolo Maldini retired, I gradually lost my passion for football, then found the spirits of Paolo in Roger 😀 I’ve started to be a Roger fan from late 2010, and always believed that he will win more slams. He won one in 2012 and am sure he will win at least another sooner or later. Happy Birthday to PeRFect Tennis! Glad to leave a note in time, as I’ve just got back from another 2 week trip today. I couldn’t watch any of Roger’s matches since later stage of Madrid but thanks to your posts I had been well-informed. Wow you’ll have 1000 fans very soon. Keep at the goat job! I think I may have accidentally clicked “No” to the question, “Is Roger Federer the GOAT?” Does that mean I am disqualified? 🙂 I’m sure at least three of my answers are incorrect, had to guess them. Can’t wait to see how I did. Happy Birthday to PeRFect tennis! I don’t think I’ll win the quiz. I might get 21/25 (and if my guesses are 100% correct, 25/25). I’m going to go back and check with Google for an accurate result. Gravatars are this summers must have accessory. For Jonathan… First of all i would like to say happy Birthday to your 2nd year of this tennis site 😀 . Also a huge thank you to yourself for putting up regular posts n analysis on Roger n all other tennis related issues. Your blogs are intellegent, in depth, witty and you say it how it is without sugar coating delicant issues. Its a testament also as your readers including myself mirror your points, therefore you have loyal and regular readers!!! I have to say for a long time iv been reading alot of other articles via tabloid tv txt n internet n by far your site is alot better than the rest. For eg Bleacher report vs Perfect tennis is like “chalk n cheese” please note cheese is my favorite and not meant by anyway cheesy or any other derogatary meaning 🙂 i couldnt think of a better example but when i do ill post it. Ps iv stopped reading Bleacher report. Anyway please keep up the hard work as i know myself its not easy writting up posts. You should also be proud of yourself as regular readers and bloggers who like me think this dedicated Federer site is awsome. I only wish i found this site long time ago!!!! Thanks for your kind words man. I’m so pleased to have stumbled across this fantastic blog! Although you’re (understandably) a massive fan of Fed, your posts still manage to be objective, and are very well-written. Many congrats! Well if you trawl through the archives you’d probably find objectivity isn’t something I aim for all the time 😉 but I just like to keep it honest. Happy Birthday peRFect Tennis! To think i have almost been following the blog for a year now, how times have past! Keep up the good work Jonathan, you know, as long as you keep posting, we keep visiting! Awesome quiz by the way, you should make more of these in the future! Happy 2nd Birthday! Lets hope Fed can give u the perfect pressie! A RG coupe des mousquetaires !!! Should work, try do it on a PC rather than smartphone maybe? How can you get the question wrong?? Didnt you write the quiz ?? Lol 🙂 only joking, i also found couple of question tough so had to guess, so defo know i havent got 25/25. Probably 1/25 knowing my memory of facts. There are some easy ones, some tricky. Anyway, the draw is completely random, just extra kudos if you do get 100%. Congratulations!! Great job, great blog!! Happy birthday, parabéns & feliz cumpleãnos to my favorite blog in the world!! Oh, can someone please blow off those candles already so we can have some cake? I’m starving! It’s gluten free too, I know you’re on the Djokovic diet. Happy birthday! amazing blog, few time to write but always reading my favorite blog.Thanks. Thanks so much for a great blog. Nice to come here after a win or a loss. Great therapy! Thankyou Sue. Plenty more of the former to come I think. Harsha, let’s play a game…let’s put your loyalty to the ultimate test. If I were to put a gun to your head, and asked you who is greater, Roger Federer, or Manchester United, and that you must make a choice, what would you say? Haha! If I visit Paris…when I visit Paris, I’ll be sure to eat there. Of course the Chipotle Burrito is an absolute junk version of a real Burrito, but it’s oh so tasty! Le Restaurant Gourmet ou l’on mange avec les doigts! Vive Le Burrito! really enjoyed taking the quiz 🙂 it looks very nice as well. Remember when Marilyn Monroe sang ‘Happy Birthday’ to JFK or in your country Ginger Spice sang it on Prince Charles birthday……. well imagine me singing ‘Happy Birthday’ to you THAT WAY right now !!! Happy birthday for your amazing site and of course for your great articles and comments. It has only been two years?? Wow. I have been posting here for six months (seems much longer). What do you want for your birthday? RG title, Wimby title or just plain and simple both? Today is my day off and I am watching Rafa now. Lost the first set, won the second set of course. Klizan is…… wow, he is good I think. And later on, the Goat !!! Go Roger go, lets show Benneteau who is the boss !!! I’ll settle for Roger giving his all on court, but my real birthday is around the time of the US Open so it’d be good he could win there! Congrats on the blog J! Thanks for the hard work and commitment you’ve put in over the years- we all appreciate it and you very much! You have great insight and knowledge of all things tennis. Even through losses you always find positives which is always important. Hopefully your blog will able to embark on one more grand slam tournament aka number 18! What a wonderful thing to do, Jonathan! Cheers! I loved the match against Benneteau. I think Roger was amazing (especially some of his shots), but I will wait for your article Jonathan. To me he looked more focused now than at the Devvarman match. Someone said he looked bored at that match and I agree, but today he was really focused, won in 1,5 hours. This was his 899th win, next match 900th!! Loved the twins too, they are so cute. I don’t know which one of them looks more like Roger. Saw the Rafa match, well you have got to hand it to him, not the conditions he wanted, but he still won. Nice win, even if it is Rafa !! Tsonga is playing really dangerous now, Roger will have his hands full. He just won two sets. Yeah Benneteau had no chance today after his 5 setter. I still think even if he was 100% Fed was getting it done here in straights. Happy Birthday !! I really havent been able to comment much lately cause I was out of town but for pretty much a year I have been completely hooked to your blog and have probably even read every comment here..It is such a wonderful blog..I hope both you and Roger keep going strong for many more years to come..
You should have asked who Fed double bageled in TMC 2005. You have a fantastic site here Jonathan and I’m thankful you have allowed me to contribute on occasion. Yeah that would have been a good one! I answered “Canas” but I feel Squillari might be the right answer. Definitely not Safin or Agassi. Jonathan, now that I’m convinced Squillari is the answer, which I thought was the answer all the time, I’m going to switch my answer. I’m also going to switch another one because I didn’t read the question. It said “in 2006” and I assumed it meant at “a slam”. Yes I will be emailing everyone their result. The quiz tool I used is more for surveys so doesn’t mark them immediately but I’ve had a friend make a tool in excel that will mark them once I pull off the results! Good scores, guess you marked it yourself!? Wait? What the? You answered all but one correctly? Are you serious? Nobody does that. Not you, not Jonathan, heck even Roger wouldn’t know every answer! Hey Jonathan – Congrats on making it to the 2 year mark. 😉 I think I’ve been following for about a year now. I so appreciate all the hard work you put into your posts; the stats, your experience, your perception and opinions and even your guest bloggers. But the thing I like most is that you always welcome comments – you always comment back – and I always feel like my opinion is at least noted. The atmosphere is quite welcoming and it’s nice to be able to interact with other die hard Fed Fans. So here’s to continued blogging!! One more thing – I heard about your blog from Ruan so kudos to him for the referral! P.S. I’m not sure how I’ll do on the quiz…I guess I’ll just jump in and give it a try. Yeah this blog wouldn’t be anywhere near as good without all the comments from the fans, makes it more interesting and helps keep me motivated so thanks for contributing! Congrats on the milestone, Jonathan! Took the quiz long back but forgot to comment somehow. Thanks for opening it up to worldwide entries. I really really want that cap! Roger in five. No way Roger loses if he wins the third. This is one of my favorite tennis sites along with Ru-an’s blog. Good posts and great comments. Couldn’t ask for more. This site is a democracy. So let’s put it to the people – should Sid be disqualified for blatantly flouting the rules? First score only! Not fair, man. You said multiple entries are allowed. Plus, I simply changed some answers. Ok, I got the Squillari answer by searching this site but I knew it was the right answer. 2) That Gravatar. ‘Nough said. 6) Did I mention the Gravatar? Haha actually I did say you can do the quiz as often as you want, forgot about that! Hey Jonathan, just took the quiz (yes, I know, last moment, but still). Nice quiz. Some questions were difficult. Nicely put together. You are a computer wizz. It looked very professional. Hope I got a lot of answers right. Ok, wait, is it your birthday today? I mean, like your real birthday? I got 25! 😀 Was a pretty tricky quiz. I had used the very useful ranking history timeline from the ATP website for the Mario Ancic ranking question! Jonathan, all these dopers who scored 25 need to be water boarded. They’ll squeal as to where they found their answers! Conal….. haven’t we learned from our Reborn Renewed RFriend Rafa (4 R’s) that if it looks to good to be true, it is…. Cheating much?? Sid…..Seriously, you can be rebirthed two or three times, YOU OF ALL PEOPLE, will NEVER take that title away from me, I OWN that title !!! 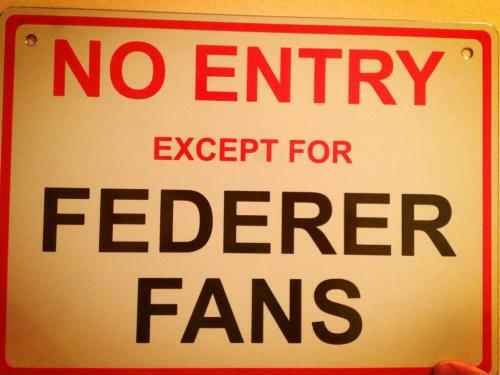 I AM Roger Federer’s biggest fan !!! So don’t even try or joke about it….. Find your own hero, Roger is mine !! !